A wonderful, intriguing story of the infamous Count Cagliostro is presented in true bizarre fashion. 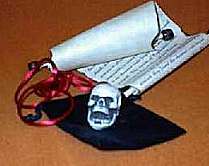 A small skull, a keepsake from the estate of the Count is used to relate a strange ritual in which the skull magically frees itself after being bound by two silken cords. You are supplied with all the props necessary to perform this ritual: a small eerie skull, silken cords, velvet pouch and an aged ceremonial scroll. Comes complete with detailed instructions.